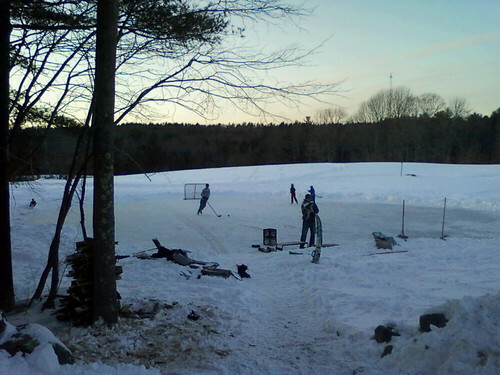 I couldn't keep up with the pace of the game--actually, it was hard for me to move around at all--but I did get to skate around a bit with a hockey stick on this frozen pond in New Hampshire today. It was a huge amount of fun and a real New England winter experience. I can't wait to do it again. Pond skating is way better than rink skating--almost like swimming in a pond compared to swimming in a pool. Nature wins in both cases.